Two weeks ago, I wrote a post on the importance of understanding logical fallacies, and in that post, I made the following claim, “anytime that an argument contains a fallacy, that argument must be rejected.” Much to my surprise, many people took issue with this and brought up the fallacy fallacy (that’s not a typo). Some of those comments were simply pointing out the existence of the fallacy fallacy (which I actually did in the aforementioned post as well), but many of them were arguing that I was wrong or at least on shaky ground because of the fallacy fallacy. For example, one person said, “of course simply pointing out that someone’s argument is a fallacy is a fallacy in and of itself,” another said that although I was not committing a fallacy fallacy I was, “flirting with encouraging individuals to commit ‘the fallacy fallacy’” (those are exact quotes, not paraphrases). Thus, it appears that this topic may not be very well understood, so I want to spend this post talking about it, because it is an important concept to grasp. My original statement was correct and in no way misleading. Any time that an argument contains a logical fallacy, that argument is flawed and you must reject that argument. However, it is possible to have a flawed argument and still have a true conclusion. So, the fallacy fallacy only occurs when a bad argument leads you to reject the conclusion rather than the argument. 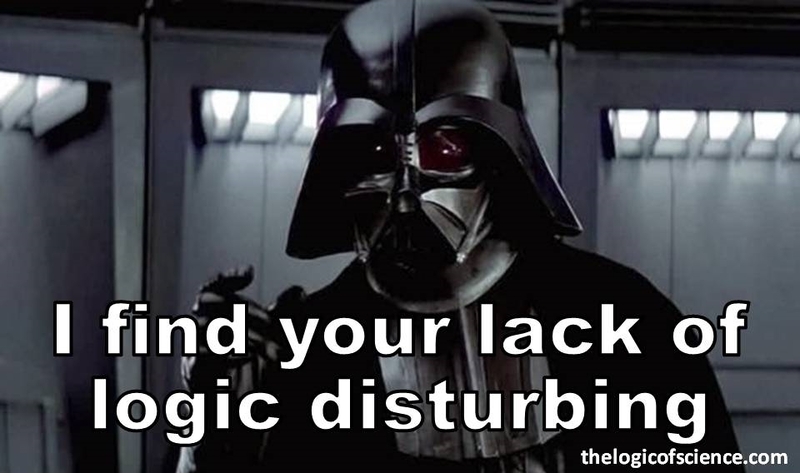 Logical fallacies are indeed disturbing. As I explained in the previous post, deductive logical arguments should be set up such that if the premises are true, then the conclusion must also be true. In other words, the conclusion must follow necessarily from the premises (an argument with this property is known as a “valid” argument). However, logical fallacies often present an invalid logical structure in which the conclusion does not follow necessarily from the premises (in other cases they may operate by doing things like assuming false premises). Thus, logical fallacies are errors in reasoning and result in arguments that either aren’t valid or aren’t sound (a sound argument is one that is valid and has only true premises). Therefore, anytime that an argument contains a fallacy, the argument itself is flawed. The logical structure does not work, and you simply cannot use that argument in support of the conclusion. This is fundamental and vitally important to understand: you must always reject a flawed argument. If an argument contains a fallacy, then the argument does not work, and you cannot use it. However, that does not necessarily mean that the conclusion is false. This is where fallacy fallacies come in. If you tell someone that their argument is wrong because it contains a fallacy, then you are adhering to the rules of logic and have not done anything wrong. However, if you tell them that their conclusion is wrong because the argument contains a logical fallacy, then you have committed a fallacy fallacy, because a bad argument tells you absolutely nothing about the conclusion. Let me illustrate this using an example from the previous post. The following argument is not valid because it contains an affirming the consequent fallacy. That argument is clearly nonsense. It doesn’t make the slightest bit of sense (it’s a non-sequitur fallacy) and both premises are rather bizarre assumptions, but the conclusion is still true! Nevertheless, although it is possible to have a bad argument and true conclusions, in many cases bad arguments do, in fact, lead to false conclusions (see previous post). In contrast, a sound logical argument guarantees that the conclusion is true. So, I reiterate that flawed arguments (including ones that contain logical fallacies) tell you nothing whatsoever about the conclusion. They provide you with absolutely zero evidence for or against it. So, what does all of this mean practically for you? How should you deal with this in debates? Well, that really depends on whether or not the burden of proof is on you. Remember, the person making the claim is always responsible for providing evidence for that claim, whereas the other person is under no obligation to refute that claim (at least until actual evidence has been provided). So, let’s imagine first that you are not the one making the claim, and the burden of proof is on your opponent. Further, they claim that X is true because of argument Y (in other words, they are using argument Y to support conclusion X). However, you discover a logical fallacy in argument Y. At that point, you should point out that fallacy and reject argument Y, however, you should not make any claims about conclusion X without first introducing other evidence/arguments (more on that in a minute). In other words, the fact that argument Y is flawed tells you nothing about conclusion X, but because the burden of proof is not on you, you aren’t required to do anything else. They have to provide a new line of evidence/reasoning to demonstrate that conclusion X is true, and you are not obligated to accept X or take it seriously until they present that evidence. Nevertheless, you may have evidence showing that conclusion X is in fact false, in which case, you are welcome to present that evidence and use it to refute X. In other words, saying “argument Y contains a fallacy, therefore conclusion X is false” is a fallacy fallacy, but there is absolutely nothing wrong with saying, “argument Y has a fallacy and, therefore, does not support conclusion X, however, we can tell that conclusion X is false because of argument/evidence Z.” In other words, you can (and indeed should) point out logical fallacies to demonstrate flaws in your opponents’ reasoning, but if you want to actually say that their conclusions are wrong (rather than simply that their arguments are wrong) then you have to present actual evidence to the contrary. This brings me to the final scenario: situations where the burden of proof is on you. In these situations, you are making the claim and, therefore, it is your duty to present actual evidence. As such, if your opponent points out a logical fallacy in your argument, you must reject that argument and either present new evidence/reasoning or admit defeat. They are not obligated to disprove your conclusion, and you cannot continue to use the flawed argument. Thus, you are obligated to present a new, sound argument and real evidence in support of the conclusion. In short, any time that an argument contains a logical fallacy, you must reject that argument. I stand by that initial claim. However, the presence of a fallacy (or other problem with the argument) tells you nothing about the conclusion. Therefore, you must always reject the argument, not the conclusion, otherwise you’re committing a fallacy fallacy. Further, to actually reject the conclusion, you need additional evidence/arguments that show the conclusion to be false. This entry was posted in Rules of Logic and tagged logical fallacies. Bookmark the permalink. I think that one problem with the post is in the premises. I.e. the argument may be logical but the premises are incomplete or plain wrong. This in my opinion is the most common case in “real world” open ended arguments. Any fool can craft a logical argument but the results may still be foolish. All three syllogisms seem valid and sound. One could, of course, substitute ‘quantum fields’ for ‘subatomic particles’, and omit ‘the naked eye’ to achieve the same results. Your examples commit what is known as a “composition fallacy.” They assume that something that is true of one part is also true of the whole. To put that another way, your last two syllogisms aren’t actually valid. The fact that an individual subatomic particle is invisible to the naked eye does not mean that something that is made of subatomic particles will be invisible. Perhaps more importantly, the definition of a valid deductive argument is one in which, given true premises, the conclusion is guaranteed to be true. Thus, if you find an argument with true premises, but a demonstrably false conclusion, then it is, by definition, not valid, and there must be some problem with it somewhere. Not necessarily. One class of fallacy is committed by scientists all the time and no one bats an eyelid: affirming the consequent. We abduct all the time as scientists most especially geologists and palaeontologists and archaeologists and everytime we abduct we are at risk of affirming the consequent. Nevertheless we don’t reject the work of palaeontologists, geologists, archaeologists, historians, plumbers, carpenters, medics and anyone else who moves from generalities to specifics. In fact there is no human being on the planet who does not routinely abduct and it is perfectly reasonable thing to do. Scientists construct probabilistic arguments, not deductive arguments, and affirming the consequent fallacies only apply to deductive arguments. You can use inductive and abductive arguments to reach probabilistic conclusions without committing a fallacy. This approach also generally involves falsifying numerous different ideas, and leaving us with the one that repeatedly makes accurate predictions. Again, however, that only shows us the most likely solution, not the definitive solution (unlike deductive logic). It’s also worth noting that, when possible, scientists try to either pit two hypothesis or theories against each other (that way at least one explanation will be falsified at the end of the test) or make exclusive predictions. In other words, when possible, we construct the prediction as follows, “if and only if X is true, we should see result Y.” That type of prediction avoids affirming the consequent fallacies altogether. Well, as you know I disagree that scientists use rigid falsification. But you are taking a narrow experimentalist view of science. Imagine a geologist who sees a fossil and says “Aha this is a the thigh bone of a T. rex.” Why? Because it looks like the thigh bone of already found T.rexes, that is abduction and he is at risk of affirming the consequent as it could be the something else bone of a something else. In more formal terms “T rexes have thigh bones that look like A, this looks like A, therefore this is a T. rex.”. Now you could argue pedantically that a few “probably”s should be inserted in the statement above but in practise the conclusions are given as certainties with the risk of affirming the consequent. If I am exploring the Sundarbans, and I see a stripy big cat-like creature. I don’t say “that was probably a tiger”, I say “that was a tiger.” Rational humans including scientists affirm the consequent all the time. Here again, you are ignoring the elimination of alternatives. Take your tiger example. It is not simply that a tiger matches that description, but rather that nothing else does. Indeed, scientists used dichotomous keys for precisely that reason. Similarly, in the case of the T-rex bone, it would not simply be a case of “it looks like a T-rex bone” but rather, “it matches the properties of a T-rex bone, and nothing else has these properties.” Now, there is always the possibility that there is some other as yet undiscovered dinosaur with those properties, but that is always the case in science, which is why science always operates functionally on “true given the current evidence” even if we don’t always explicitly put it in those terms.